William Bass, PhD, forensic anthropologist well known for his research at the University of Tennessee facility known as "The Body Farm," recently presented to Radiology residents, discussing the investigation of a past case to illustrate the importance of radiology as a tool utilized by forensic anthropologists. First-Year Radiology Resident Jeff Mahony, MD, said, "Dr. Bass's enthusiasm for his work is inspiring. I would be happy to collaborate with forensic anthropologists in my future career." Jay Whelan, PhD, Department of Nutrition, "Diet and Translational Cancer Research: From the Land, to the Lab, to the Clinic..."
Tingting Xu, PhD, Center for Environmental Biotechnology, "Autobioluminscent Cells: A New Tool for in vivo and in vitro Bioimaging"
Elizabeth Barker, PhD, Mechanical, Aerospace, and Biomedical Engineering, "A Strategy for Improving Drug Penetration in Solid Tumors"
Vermont Dia, PhD, Department of Food Science and Technology, "Luteolin and Epithelial-to-Mesenchymal Transition in Ocarioan Cancer Chemoresistance"
Francisco Barrera, PhD, Department of Biochemistry, Cellular and Molecular Biology, "Novel Soluble Peptides iwth pH-Responsive Membrane Insertion"
Dallas Donahoe, PhD, Department of Nutrition, "Blame It on My Gut Bacteria: How Microbe-Host Interactions Influence Cancer"
Tim Sparer, PhD, Department of Microbiology, "The Role of Chmokines in Cancer"
Rebecca Shorter, PhD student, Clinical Psychology, "Promoting Cancer Life Management through Integrative Healthcare: Effectiveness towards Decreasing Psychological Distress"
Scott Stevens, MD, Professor of Surgery, Director of Endovascular Surgery, and Co-director of the Aortic Center, delivered the Presidential Address at the 40th annual meeting of the Southern Association of Vascular Surgery in Cancun, Mexico. The speech, which he wrote in consultation with Harvard School of Business Professor Clayton Christensen, was entitled "Pioneers and Innovators: Creative Disruption in Vascular Surgery." The Southern Association for Vascular Surgery is widely considered the most established and vibrant regional vascular organization in the world. Dr. Stevens's presidential address will be printed in the Journal of Vascular Surgery. 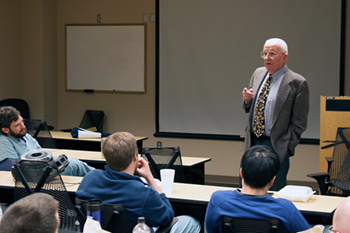 Dr. Stevens also spoke at the meeting as the Jesse E. Thompson, M.D. Distinguished Guest Lecturer. Joshua Arnold, MD, Assistant Professor of Surgery in the Division of Vascular and Endovascular Surgery, also presented. His presentation, "Clinical Outcomes of Double Mandibular Osteotomy for Exposure of Skull Based Carotid Artery Pathology," is co-authored by Ryan Buckley, MD; Michael McNally, MD; Oscar Grandas, MD; Scott Stevens, MD; Mitchell Goldman, MD; Eric Carlson, DMD, MD; and Michael Freeman, MD. 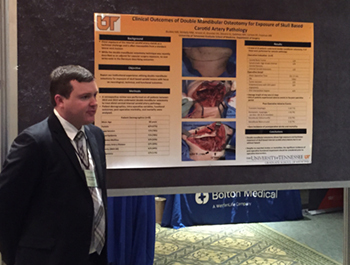 Surgery Resident Ryan Buckley, MD, also presented. 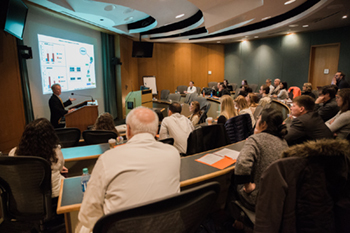 His presentation, "Dietary Zyflamend Inhibits Intimal Hyperplasia Development via the Attenuation of Macrophage Infiltration in a Rodent Model of Vascular Injury," is co-authored by Deidra Mountain, PhD, Lindsay Bools, MD, Stacy Kirkpatrick, Jay Whelan, PhD, Paul Terry, PhD, Michael Freeman, MD, and Oscar Grandas, MD. 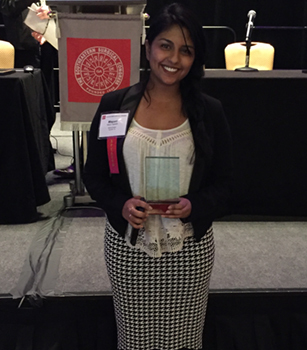 Miyuri Jagadish, a graduate assistant student from UT Knoxville, won a gold medal at the Southeastern Surgical Congress for his paper, "Diabetic Foot Ulcers: The Importance of SACredit Patient Cormorbidity Recognition and Total Contact Casting in Successful Wound Care." The paper is co-authored by Mitchell Goldman, MD, Michael McNally, MD, Eric Heidel, PhD. The Gold Medal Forum Committee says a Gold Medal Award is a prestigious recognition of excellent research. Dr. Foster and Dr. Hudson's article on Contemporary update on the treatment of dog bite injuries was chosen by JOMS Clinical Focus on Facial Trauma Update as 1 of 10 as a 'Must Read' in the February, 2016, Volume 74 - Number 2 edition. UT System President Joe DiPietro, DVM, released a video highlighting UT's Strategic Plan Refresh Project, a project building on the momentum and achievements of the first two years of the 2012-2017 UT System Strategic Plan to advance the University's vision for a “best in class” system. He released the video during his State of the University address featuring the impact of UT's comprehensive portfolio and its educational, research and outreach assets geared to the diversity of the state through campuses and institutes. All focused on a “best-in-class” university system, these multiple components produce considerable benefits for Tennesseans. 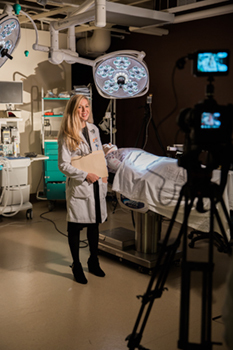 As a participant in the video, Internal Medicine Resident Jennifer Winbigler, MD, represents UT's commitment to healthcare education. Watch the video on YouTube.